The 2017-2018 school year is off to a great start, and the students you send to us each day have shown themselves to be engaged and committed students and citizens. Thank you for supporting our school in so many different ways. We welcome your continued participation and support. As you read through this newsletter, pay special attention to service opportunities that may be available to you and your family. As we have watched the news over the past 6 weeks, we have witnessed the devastating impact of natural disasters and random violence. We are often left asking, What more can I do? How can I help? While our school's plan to support the people of Puerto Rico is large-scale and fully developed, I encourage all students (and families) to research an issue and design a service project to educate others and/or support those in need. This may be an issue of personal or local importance, or it may be of a national or global concern. Take a look at the Prudential Spirit of Community link. It is such an inspirational site that will remind us of the power that we all possess. Lastly, with so many fun and exciting events coming up in October, I thought it might be helpful to highlight the goals and expectations for Spirit Week and Halloween at ITMMS. I do hope the accompanying newsletters are helpful and assist you in your planning. Our school will stop all activities in the morning and will will be prompted to display and watch a "Kid President" video. This video is about “making tough choices.” After the video concludes, students and staff will review as a class the challenges facing each of them and review strategies for responding to these challenges. 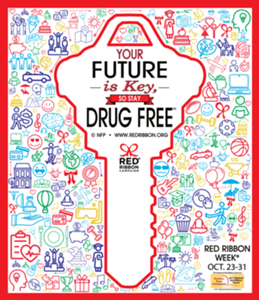 Students and staff are encouraged to decorate their classroom doors in support of Red Ribbon Week. The theme of this contest is “being drug free” Three winners will be picked on Friday, October 27th. Prizes include surprise guest classroom entertainers, students being named DJs for a day (make a playlist and it will play between periods), and students from each homebase/homeroom doing the announcements daily until each student gets a turn. 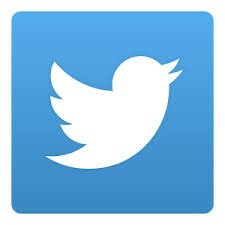 Students and staff are encouraged to use Twitter or Instagram to share their favorite healthy activity. To submit their photo, they must Tweet @islandtreesMMS and tag @islandtreesmms on Instagram. For this contest, they can use the hashtag: #ITdrugfree Prizes for this contest will be in the form of gift cards. Listen to the word of the week each morning on announcements and feel free to discuss the word and do activities based on the word abstain. All students will sign the pledge banner at lunch on Friday 10/27. Wear red! : All students and staff will wear red to support the cause. Red ribbons: Students and staff will be given a red ribbon sticker. Please wear this with pride! Don't forget to wear red! Boston 2017 Thanks for following our trip to Boston! Please be sure to return to this page as more pictures will be added. The Island Trees National Jr. Honor Society, the New York State Chaplain Task Force and New York Police Department are asking the ITMMS community to help in sending much needed items to hurricane damaged Puerto Rico. The people of this beautiful Caribbean Island are in desperate need of so much, and we would ask that you review the list included on our flyer. Additionally, in concert with the Levittown School District, we are also collecting financial donations for Puerto Rico. Please download the Levittown Cares flyer and follow the instructions for donating to this cause. As part of our community service campaign, this section highlights the ITMMS students who demonstrate a commitment to serving their school community. Through acts of selflessness and kindness, these students embody the spirit of community. An example of great citizenship is found in the work of Joseph Evans, a 5th grade student at ITMMS. Joseph, with the help of his family and their connection to the NYPD, proposed a collection for the citizens of Puerto Rico. 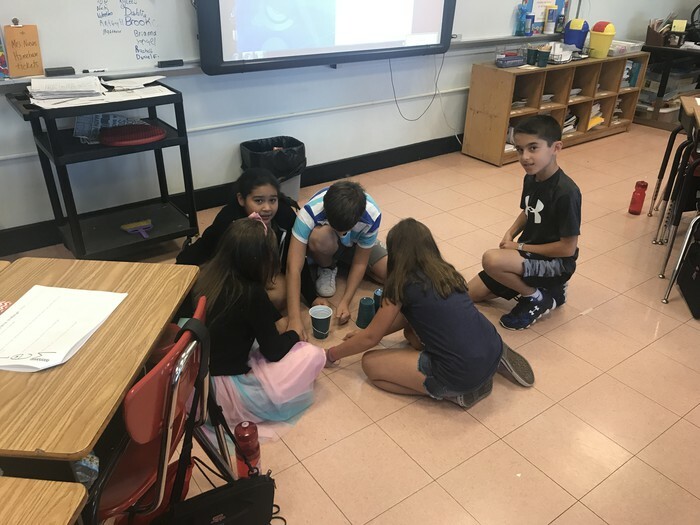 As it happened, Joseph's teachers--led by Mrs. Nieves, Mr. Gonzalez & Mrs. Harouche--were in the final stages of planning our school's humanitarian efforts in support of the people of Puerto Rico. 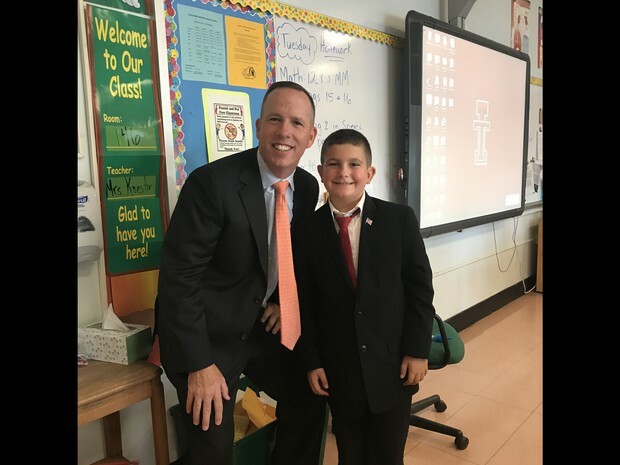 Joining forces with his teachers and our school, Joseph's demonstrated leadership and his humanitarian focus speak to the power that we all have to help others and serve our community. Are you a middle of high school student who is making a difference through volunteering? Apply for a 2018 Prudential Spirit of Community Award and you could win $1,000 and a trip to Washington, D.C., in late April! 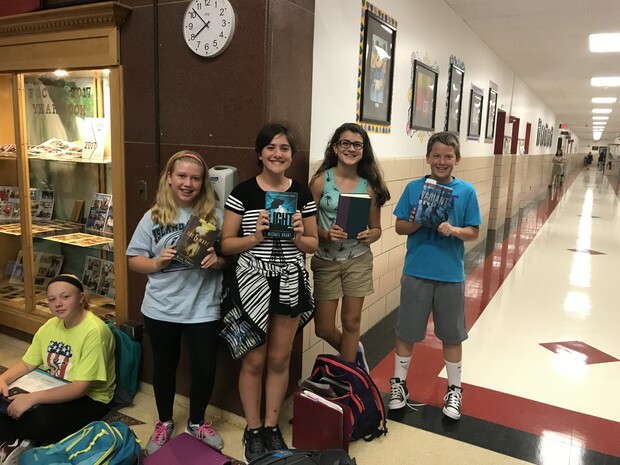 When our students at Island Trees Memorial Middle School enter seventh grade English classes, they begin the year with a novel called A Long Walk to Water. It is the story of the journey of one of the Lost Boys of Sudan, Salva Dut. The Lost Boys are a group of young boys who were forced to flee their homes and country (on foot, through the African wilderness) as a result of civil war in their villages. As an exciting addition to our curriculum this year, we are lucky enough to have a guest speaker, Sebastian Maroundit, also a Lost Boy of Sudan, come to speak to our seventh and eighth grade students. Sebastian has created an organization called Building Minds in South Sudan. Their mission is to rebuild schools in war-torn, poverty, and famine stricken South Sudan, as well as to promote gender equality in education. Because of the ongoing war in South Sudan, education has suffered greatly. Take a look at the link below to see how our school will help rebuilds schools and promote gender equality in South Sudan. As a school community we celebrate all who come through our doors in the morning. Though the academic work can be challenging and the pressures that come with adolescence can be draining, we are a middle school which supports all learners--intellectually, socially, and emotionally. 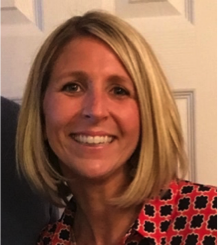 This section highlights the "Humans of Island Trees Memorial Middle School," with a nod to our staff member's recollection of life as a middle school student. Enjoy! "I never thought I would be a middle school teacher, although I knew from a young age that I wanted to teach. I always thought I would be an elementary school teacher and here I am, 15 years at Island Trees as a middle school math teacher and I couldn’t image doing anything else. Over my 15 years here, I met my husband and some of my best friends. I have become a mother to a now 8-year-old son, Collin, and 6-year-old daughter, Molly. Being a mom is the best thing that has ever happened to me. It has made me a better teacher, as I always ask myself, If my children were in this classroom, what kind of teacher would I want them to have? Family is everything to me. I truly believe in creating memories and traditions that will last a lifetime. I have a family home in Lake George where I have traveled to since I was a child and now my own children go often and I hope the traditions and memories will carry on. I believe education starts at home and family support and encouragement is life’s greatest gift. I want to teach my children and students to be confident." This section has been designed to shed additional light on some of the events and activities from our classrooms and assist all of you as you continue to inquire of your children, "How was your school day?" 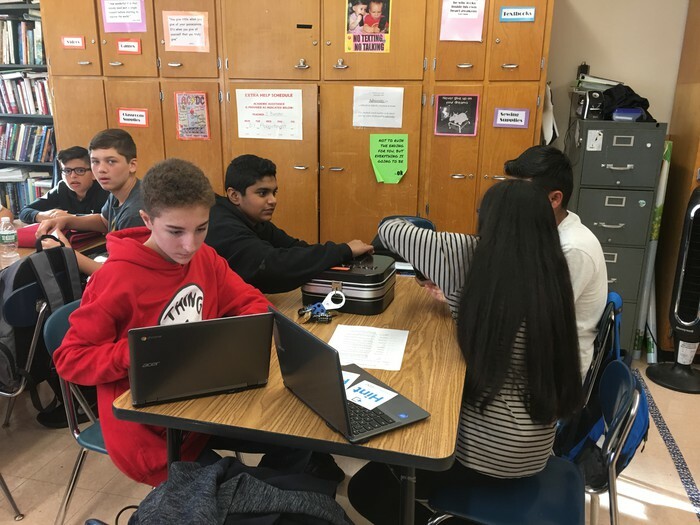 Additionally, now that all of our students have a Chromebook, you are certain to see and hear of apps, websites, and teaching models which, at first glance, may not seem familiar to you. I will try to use this section to communicate the role of these new applications and methods. Breakout EDU is the immersive learning games platform. 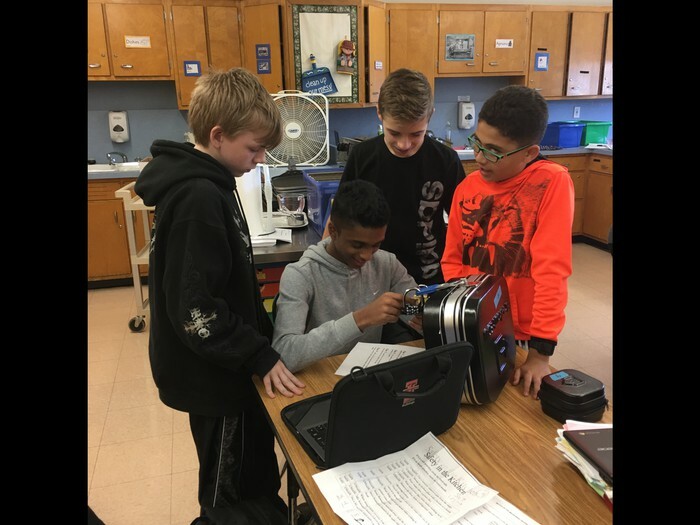 The Breakout EDU kit allows for the facilitation of games where players use teamwork and critical thinking to solve a series of challenging puzzles in order to open the locked box. Games are available for all ages and content areas. In reviewing for an upcoming test, Home and Careers teachers Mrs. Bunster and Mrs. Purrman created an activity using Breakout EDU. 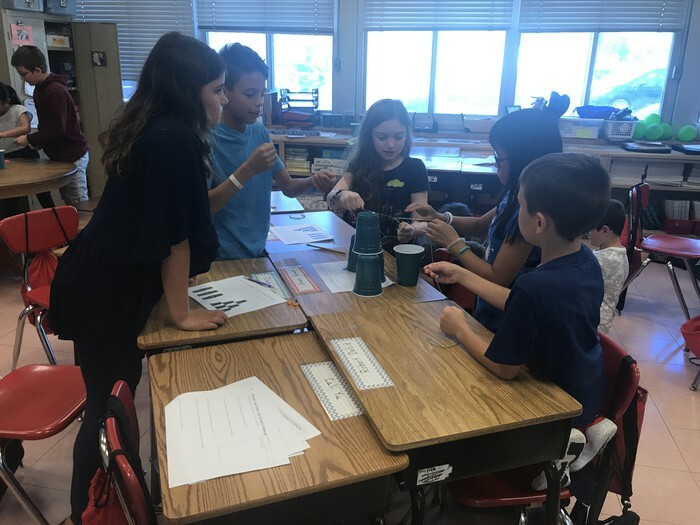 Students in these classes had to use information on kitchen safety, measuring equivalents and measuring techniques in order to help them break into their boxes. They were given a scenario that involved Mrs. Purrman and Mrs. Bunster being locked out of our classroom with cookies baking in the ovens. They needed to get us back inthe classroom to save the cookies. 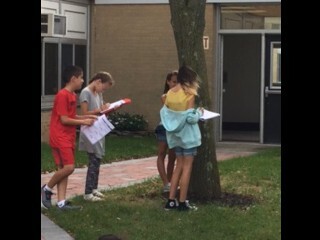 The use of the information they had learned, the dialogues on measuring equivalents and their teamwork was amazing to watch. Keep your eyes out for additional notes from the classroom! 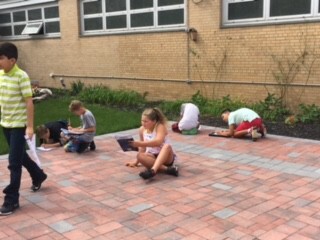 Walk around our school before Homeroom, step onto buses at dismissal, or circle the cafeteria during a lunch period and you are likely to find students buried in a book. No, not only a school-assigned book, but one that is driven by a passion or a particular interest. Though we have and will continue to create many opportunities to promote reading across the curriculum, we would ask that you continue to support your child's independent reading outside of school. 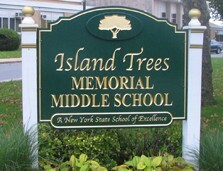 Island Trees Memorial Middle School requires all students to have a book of their choice with them at all times. Teachers often set aside 5-10 minutes of class time to silent reading in order to promote reading stamina and skill development. We also have students read whenever there is any downtime in class. Most importantly, teachers very often to read with their students. This has really had an impact on students reading because they see our love as well. We have had kids make quick review posters for other classmates who might need an idea of a book to read. 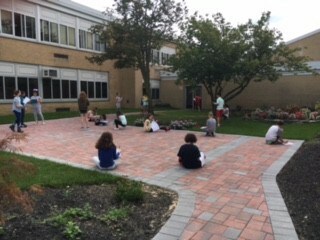 Thank you for connecting with our school in so many ways. 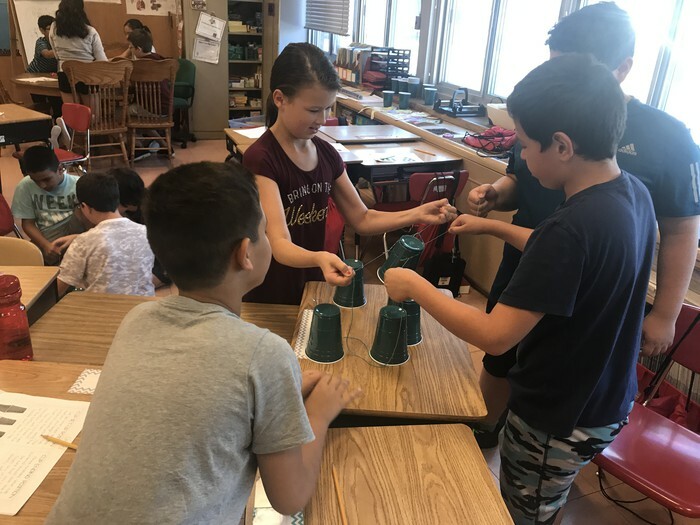 Whether it has been at a trip meeting for Greenkill or Washington DC, Meet the Teacher Night, or the 5th Grade Welcome, it is clear that the home-school connection is strong. I wanted to use this section to remind all of the ways in which we continue to connect with families. Please be reminded that our school's daily announcements are posted on our website. These announcements come from teachers, coaches, and club advisors. Please be sure to review these announcements by selecting the "Daily Bulletin" link on our school's website. Our teachers work hard to keep families connected to their classroom by posting homework to our website. Please be sure to review the "Homework Online" link on our school's website. Maybe you read something in a school newsletter and wanted to go back to review. Perhaps you missed a newsletter but heard it was worth reading. Find all of our Home-School newsletters on our school's webpage. Want to celebrate so many of the great things happening in our schools? Sign up for our IT-Grams and IT-Grams will be sent directly to your inbox. 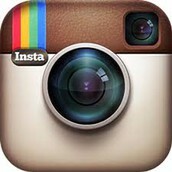 You can also view our library of IT-Grams from our website. The screenshot below is an illustration of the form found on our website to sign up for IT-Grams. Though decisions regarding the use of social media should be made by families, it is important to know that adolescents are increasingly drawn to this medium. 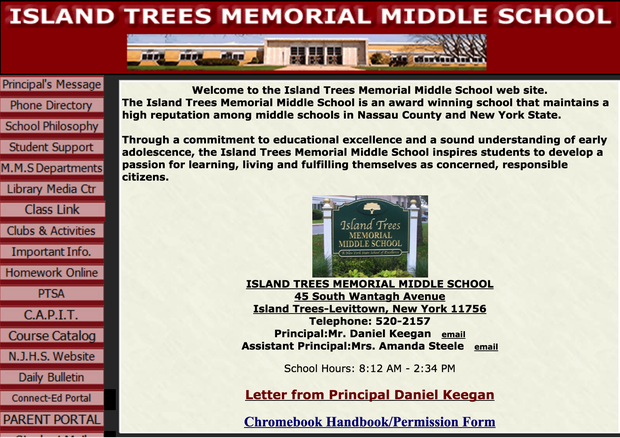 The Island Trees Memorial Middle School will make every effort to model the appropriate use of social media and support your children as they navigate the digital age. 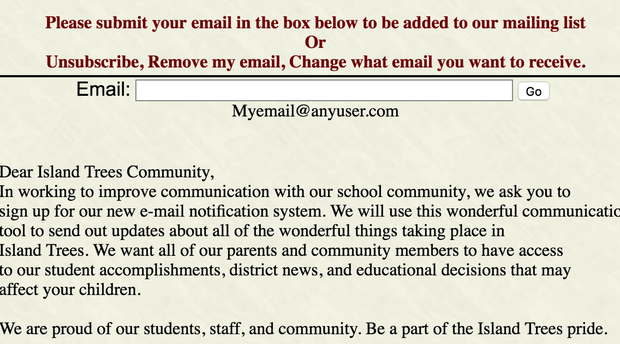 Though e-mail and phone calls are still welcome and useful, we will seek to leverage the power of technology to provide school-based updates in multiple formats. To this end and to keep the lines of communication open between home and school, we ask that you consider following ITMMS on the platforms below. Follow us @Islandtreesmms for updates on so many great events in our classrooms, playing fields and stages of Island Trees MMS. Our middle-level students are increasingly drawn to this visual medium, and it is our goal to meet them where they are. Follow us on Instagram for a visual look at our school--from the classrooms to our concert halls. It is our hope that this online newsletter provides important updates and serves as another strong link between home and school. Please reach out to Mr. Keegan if there are other resources that you believe would strengthen our communication. 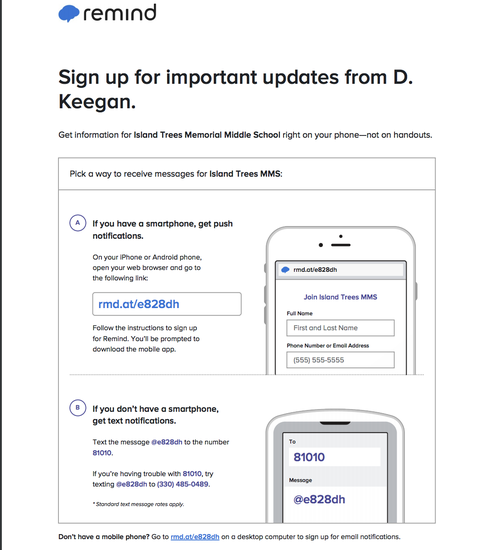 In addition to our newsletter, The Home-School Connection, our Twitter and Instagram pages, school website and I.T.-Grams, Island Trees Memorial Middle School would also like to invite you to join ur Remind group. 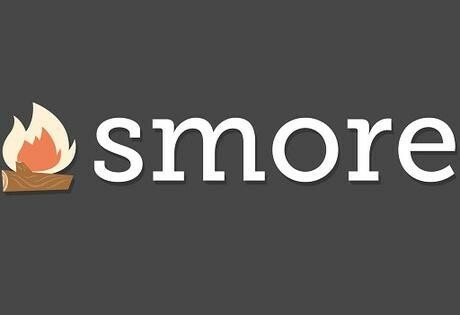 Remind will be used to update you on events that must be changed or altered on short notice. Please follow the sign-up instructions on the handout below. This space highlights the many programs that are geared toward middle-level learners. Please encourage your child to participate in competitions and contests that speak to his/her passions and interests. This section has been created to help parents and families better understand the needs and characteristics of young adolescents. The research and briefs shared below highlight the significant changes that our students are going through and the ways in which families and schools can best support our children. Please bookmark the following websites as they will be important points of reference throughout the year. Each site will be update throughout the year, providing timely and important updates regarding our academic and co-curricular programs.